Peaceful scenic landscape of the sun setting next to the Rocky Mountains and colorful sky reflections in the lake waters and bank of McIntosh lake, Longmont Colorado, Boulder County. Add colorful peaceful nature landscapes to decorate your office walls, home walls, cafe, restaurant, boardroom, waiting room, health clinic, trade booth or almost any commercial space. Museum quality art with fast, secure, world wide shipping to your door. 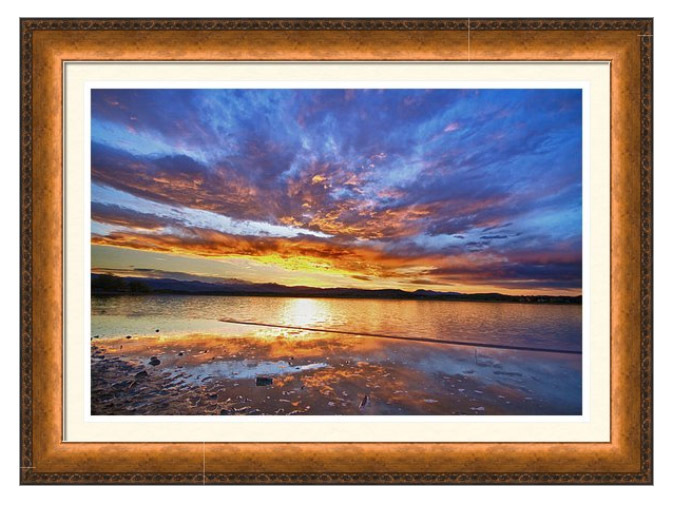 Peaceful Reflections custom framed prints by James BO Insogna. Ships within 3 – 4 business days and arrives ready-to-hang with pre-attached hanging wire, mounting hooks, and nails. Choose from multiple print sizes, papers, mats, and frames. Peaceful Reflections metal art prints ships within 3 – 4 business days and arrives ready-to-hang with pre-attached hanging wire, mounting hooks, and nails. Multiple sizes available. 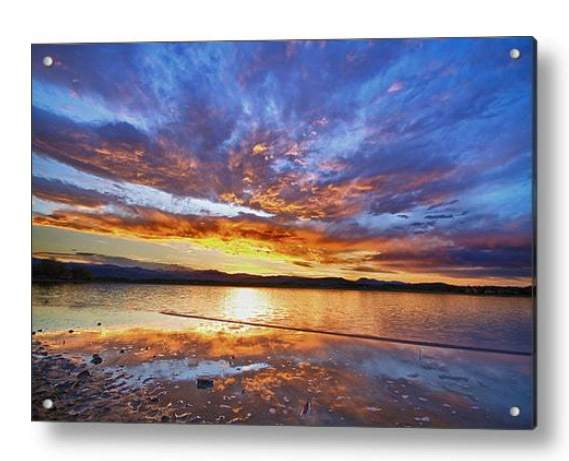 Your fine art image gets printed directly onto a sheet of 1/16″ thick aluminum. 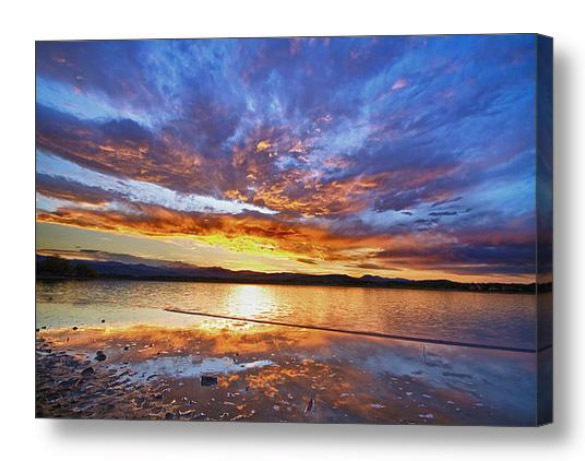 Peaceful Reflections canvas art prints are printed on premium canvas and stretched on 1.5″ x 1.5″ stretcher bars (gallery wrap) or 5/8″ x 5/8″ stretcher bars (museum wrap). Ships within 3 – 4 business days and arrives ready-to-hang with pre-attached hanging wire, mounting hooks, and nails. 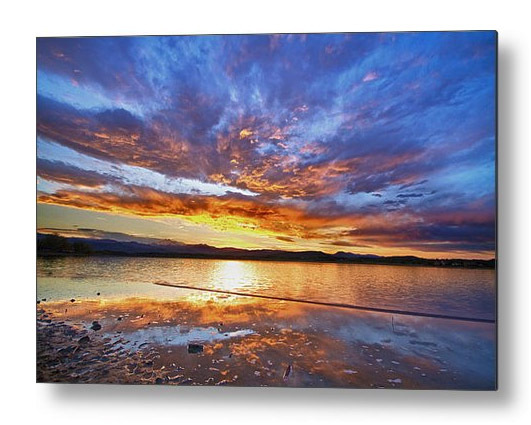 Choose from multiple print sizes, border colors, canvas materials, and frames. Peaceful Reflections acrylic art prints Ships within 3 – 4 business days and arrives ready-to-hang with all mounting hardware included. Choose from multiple sizes and two different mounting options (metal posts / hanging wire). 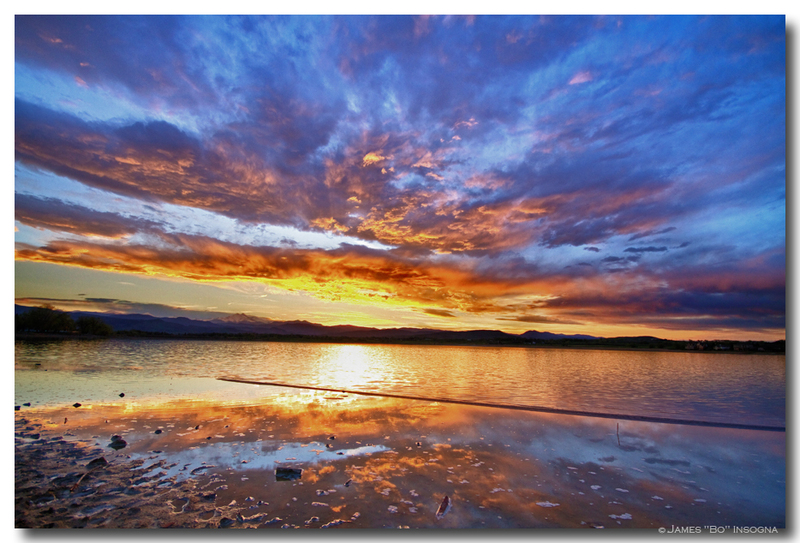 Your fine art image gets printed directly onto the back of a 1/4″ thick sheet of clear acrylic. 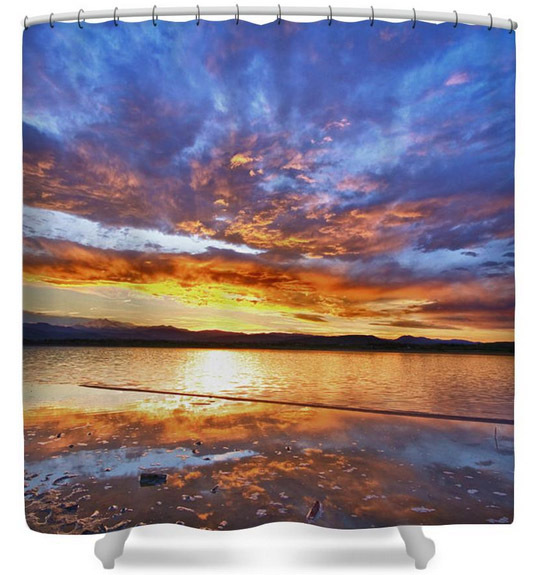 Peaceful Reflections shower curtains are 100% polyester fabric. 71″ wide x 74″ tall. Ships within 2 – 3 business days. Our shower curtains are made from 100% polyester fabric and include 12 holes at the top of the curtain for simple hanging from your own shower curtain rings. The total dimensions of each shower curtain are 71″ wide x 74″ tall. Fine art nature landscape weather photography fine art prints, framed prints, canvas prints, acrylic prints, metal prints, phone cases, throw pillows, duvet covers, greeting cards and photo images for licensing by James Bo Insogna (C) – All Rights Reserved.